Here's a new twist on adult coloring. 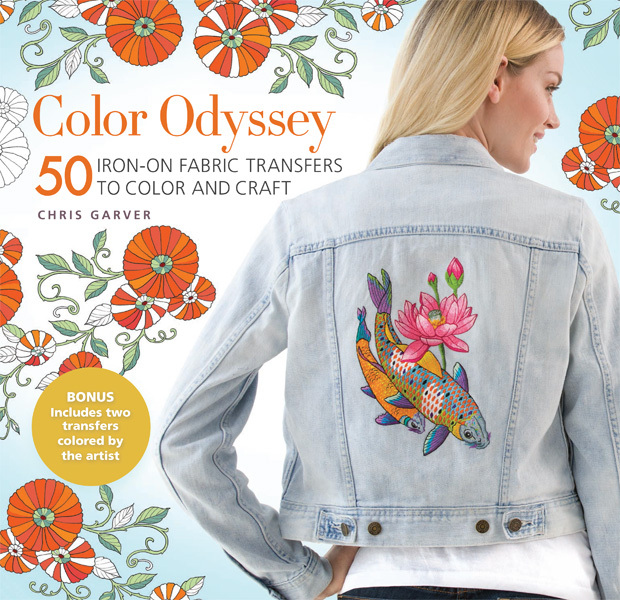 With Color Odyssey Fabric Transfer, you can transfer images from Chris Garver's Color Odyssey to any fabric, then color the design directly on the fabric for countless creative possibilities! The process is simple: Choose any of the 48 black and white drawings featured in this book, transfer the design to any fabric with a hot iron, then color in your design using fabric markers. Two bonus colored transfers, colored by Garver himself, are provided. The fabric transfers work for embroidery as well. With these unique transfers, only the black lines of the artwork are applied to the fabric, leaving all other spaces blank for fabric to show through. From gifts to clothing and home decor, there is an abundance of projects possible using this technique. Four pages of instruction and inspirational project photos are included to encourage users to bring their coloring prowess to the medium of fabric and expand their creativity.